SOLICO are able to provide the bolted tanks suitable for placement on the tower designed to carry the load bearing capacity of the tank and its content. Rectangular Sectional Tanks are best suited for this application due to the fact that the load can be spread broad and wide as opposed to cylindrical tanks which tend to be pencil type on towers and therefore delivering a load focused on a smaller foot-print. Rectangular Sectional Tanks are available in GRP / FRP the lightest option followed by Galvanized Mild Steel or Stainless Steel both of which are suitable alternatives though they have a distinct weight disadvantage. Cylindrical Steel Tanks are available in Zinc Alume the lightest option in steel followed by the heavier metals, Galvanized Mild Steel, Epoxy Powder Coated or Stainless Steel. 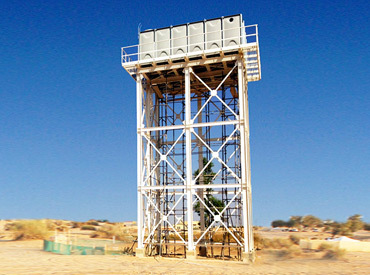 In order to provide the information that will be required by the engineers for Tower Design it is essential that all details related to the size of the tank, and height of the tower as well as local seismic conditions will be required to deliver a solution which has considered the foundation details, the steel tower structure and the best suited liquid storage solution for the application.